The base of this bar is a shortbread cookie with a hint of coffee and cinnamon followed by a layer of melted chocolate and a sprinkle of caramels on top. Instead of buying Heath bars (which aren't typically available in Canada although The Candy Store in Ottawa imports them) or Skor bars, I made my own caramels and pulverized them in my food processor. One of the best take aways from this recipe was lining the pan with aluminum foil. The liner makes it easy to remove the cookie base from the pan and put it on a cutting board saving your nice pan from the sharp edges of your knife. I also learned a bit more about Heath bars vs Skor bars. Check out my poll on my right sidebar and let me know your favorite treat. You can find the recipe for Caramel Crunch Bars in the book Baking: From My Home to Yours by Dorie Greenspan or here. To see how the rest of the TWD group fared with this week's recipe, click here and then click on each blogger! Click here for the recipe for Golden Vanilla Bean Caramels. How can you go wrong with shortbread, chocolate and caramel chunks. It would be fun to play with the shortbread base, but why mess with perfection? Chocolate Armagnac Cake — The Cake That Got Me Fired on pages 279-281 chosen by Lyb of And then I do the dishes. Mmm, your bars sound extra special from the use of your homemade caramels. How yummy! I can't wait to try this recipe! That caramel on top looks delicious. But of COURSE you made your own caramels. Of Course! You are one tough chick. I actually vote for Skor! Love your post - and thanks for pointing out the tip on the foil - I plan to make these tonight. My first TWD that I do plan to make and am making really late! Those look scrumptious! I'm a sucker for anything with caramel. Have you tried non-stick foil for things like this? I use it when I do anything with molten caramel, and it works really well. Wow, I bet that making your own caramel really took these to the next level! Although I do love some heath. I agree -- the foil trick was a great one; I am likely to use it with many bar cookies/brownies going forward. Your crunch bars look amazing! I love making caramels. What a great idea. I bet a caramel-y layer went just as well as a toffee layer. These look amazing. 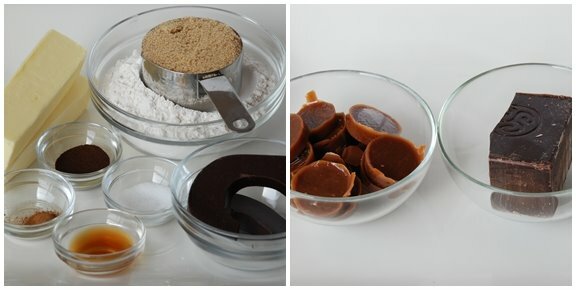 I've never attempted caramels, but I really want to right now. Yummy looking!! The caramels look fab, too. Shari - thanks for updating my blog! LOVE your bars! I especially like the clear, dotted background -very nice effect! They look fantastic. I wish I had stores here that sold blocks of the "good chocolate" like I can tell you use - I usually have to order them online. Very nicely done! P.s. : Thanks for the foil tip! YOur bars look amazing. They were very very delicious and even better with ice cream. YUM! They look great! 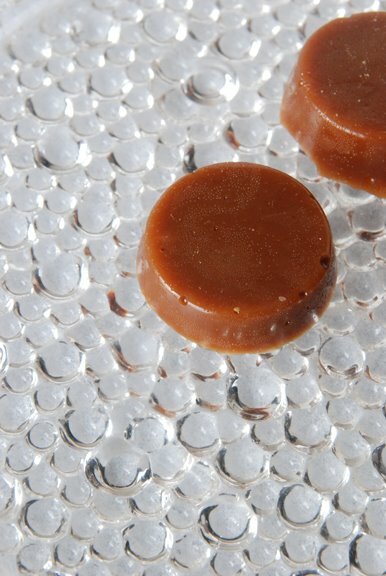 I love your bubbly plate, and that you made your own caramels! I love the idea of putting caramel on top. I made my own toffee which worked out nicely. "Bubble, bubble, toil and trouble. . ." what great bubbly photos you have!! I love the homemade caramels on the side. Gorgeous. Oh those look -so- good! I'm very tempted to veganize this recipe. Ooh, I love that plate! It makes the photos just pop. Your bars look lovely...and those little cups are so cute. Great job! Beautiful bars. Love the 'hobnail' plate. Gorgeous and I bet delicious!! I'm loving how your caramel in the first picture has the same look as your bubbly plate. Very cool! 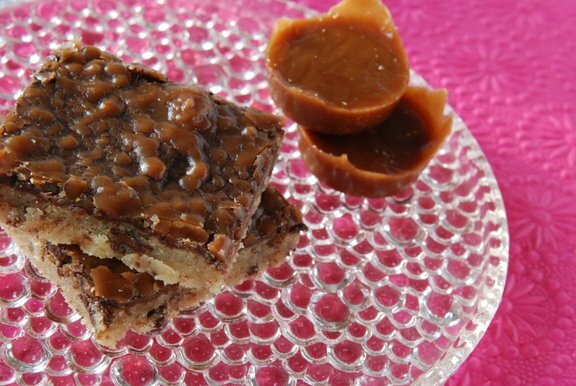 You get extra points for making your own toffee/caramel topping. Yum! Love your tip about how best to line the pan with aluminum foil. I'm going to try that! Your bars look amazing! I bet they were delicious topped with caramel. Love the homemade caramels - especially love that you, not me, made them. I'm petrified of molten sugar! The foil was cool, but I couldn't figure out why Dorie wanted us to cut the bars without cutting the foil. It wasn't like we were going to reuse it. Great combo of some of my favourite sweets. I could see myself devouring a whole plate of these with some warm milk. Lovely photos! Great looking caramel bars. wow.. looks great !! especially love the homemade caramels, well done !!! Making your own caramels is impressive!! :) Your pictures are always beautiful. Wow, what a creative twist to your treat and post! I am a Skor girl. I just love them when I can find them. how cool that the top of your bar matches your plate! these look super good, esp since you did make your own caramels!! Oooohhh I just totally put that Golden Vanilla Bean Caramel on my list of things to make! Delicious! crazy goodness! these look incredible. love the caramel! oh my goodness.. that looks great-- of course the week after I resign myself to not participating a recipe like this comes up! well yours looks just scrumptious! Why am I not surprised you made your own "heath / skor bars?" Beautiful job, as always! 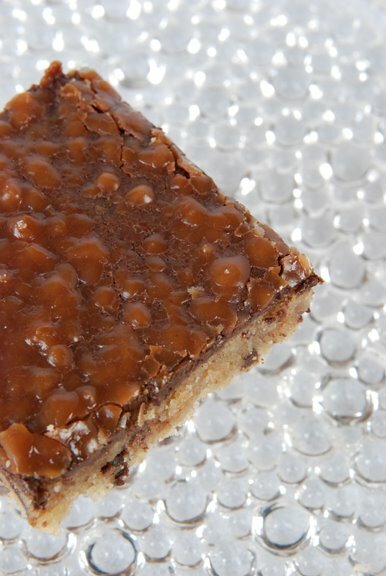 i love the texture of the plate and the tops of your caramel bars. So pretty.